Manchester rivals take their battle for supremacy to the world stage but who’s winning the hearts and minds of fans in distant markets? 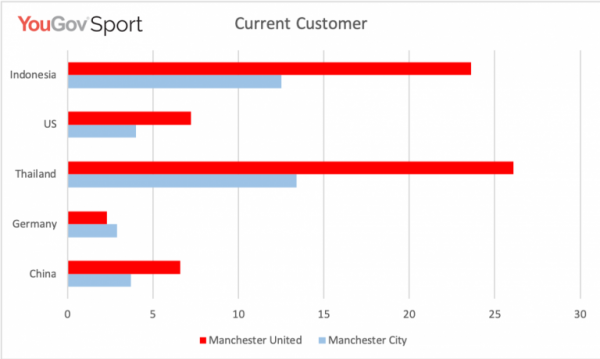 Under the ownership of Sheikh Mansour the light blue half of Manchester has been getting the better of its red neighbours in recent years in the Premier League. But while that may hurt United’s fans in the city, what does it mean for their followings around the world? YouGov Sport, which tracks the perception of the clubs every day in a number of markets has found that City’s dominance in the League is being eclipsed by their rival’s popularity in major markets around the world. Using its Current Customer metric, YouGov asks whether respondents have followed or watched a club in the past year – a good indicator of fandom. As you can see, United outperform City in most markets and enjoy almost double City’s followings in Indonesia, China and Thailand. The exception here is Germany where City have more followers, but this may well be because many German fans will have watched City in the UEFA Champions League this season having played Schalke and Hoffenheim in their last two matches. In addition to the Current Customer metric, YouGov also noted Recommend which asks respondents if they would recommend watching a team or not. City beat United in three markets – Indonesia, Thailand and Germany – where they come significantly more highly recommended than United. But football fans in China and the US would still endorse the Red Devils over City. The results suggest United’s appeal has retained its lustre for longer among these fanbases. 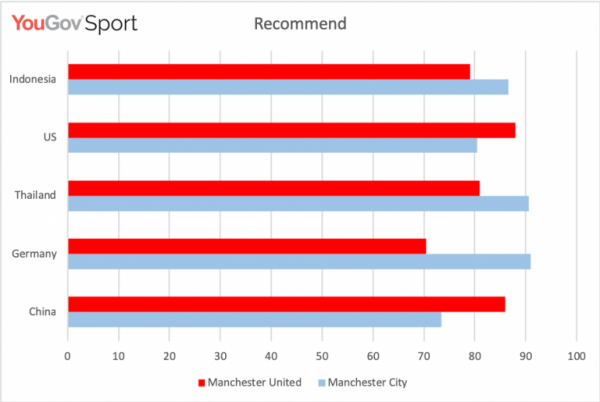 However, the Recommend scores are uniformly very high, suggesting that both clubs have great potential for growth. And while it’s a truism that trophies do win fanbases, the two aren’t strongly related. 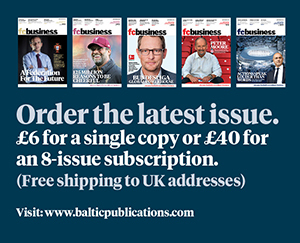 Liverpool, who haven’t won the main prize in English football in nearly 30 years, enjoy a bigger Current Customer score than Manchester City in all of these territories. Shifting the needle in foreign territories is harder than it looks.